The civic polls in the Hills on Sunday cast a large shadow on tourists in the Queen of the Hills. Though the day passed off peacefully, the town wore a deserted look, with majority of the shops and business establishments remaining closed. 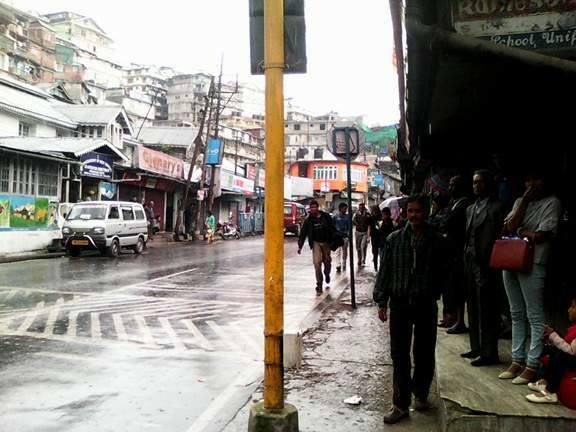 With the mercury shooting up in the plains, Darjeeling has been witnessing a tourist onrush at this time. Most of the hotels and homestays are booked to full capacity. The day saw most of the tourists hunting for eateries as majority of the restaurants remained closed. “Most of the eateries are closed except for a few high-end ones. Even the paan shops are closed. We managed to find a paan shop and bought biscuits and chocolates which we had for lunch,” complained Pawan Sharma from Lucknow. Many survived on corn on the cobs being sold on the streets. “I did brisk business. By late afternoon all the corn-cobs were sold out,” stated Phulmaya Thami, a road-side vendor. The shops selling woolens which are the hot favourites of the tourists had their shutters down as well. “The situation is so peaceful. Unless one is informed, it is difficult to gauge that polls are being held. It’s just like any other day except for the shops remaining closed. When things are so peaceful what is the logic behind closing the shops,” questioned Sharmila Ghosh, a tourist from Behala, Kolkata. Even the shopping malls and the multiplex remained closed. “There is no justification behind keeping the shops closed. It’s peak tourist season. We have lost out on a business day. The unions asked us to close down and so we did. They could have at least told us to open our shops in the evening. The tourists usually visit our shops in the evening after sightseeing,” stated the owner of a woolens’ shop on conditions of anonymity. Tourist vehicles saved the day. “We spent the day visiting the tourist spots. If the tourist vehicles did not ply, a day would have been wasted,” said Subhendu Sarkar from Kolkata. However, taxis plying to Siliguri were scanty and there were complaints of overcharging as well. On the other side, there were others who were not complaining. “Polls are like any other day for us in Australia. We had heard that polls in India are usually marred in violence. There was no such thing in Darjeeling. It was a peaceful day. There was less vehicles today — a perfect day for a good walk,” said Mike from Australia. As for the local residents, it was a Sunday to sit back and relax. “There was a person selling mutton in a shop that was open in the outskirts of the town. The queue in front of his shop was longer than the queue at the adjacent polling booth,” stated Lekhnath Poudel, a resident.